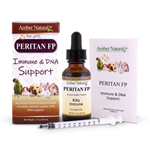 Peforacide® is EPA-Registered to kill canine parvovirus, feline calicivirus, avian influenza-A virus, MRSA, E. coli, and many more viruses, bacteria, fungi, algae, mold and mildew. PERFORMACIDE® is easy to use. It requires no wiping and no rinsing. The active ingredients are contained within a handy pouch. Simply insert the pouch into an opaque container and fill with water. No more pouring chemicals or complicated dilutions. Eliminates messes, spills, and many safety concerns. Performacide® is safe to use on stainless steel, plastic, vinyl, and stone without corroding or causing wear & tear. An ideal solution for groomers, kennels & day care, veterinary offices, feed & supply stores, pet shops, and animal rescue facilities. 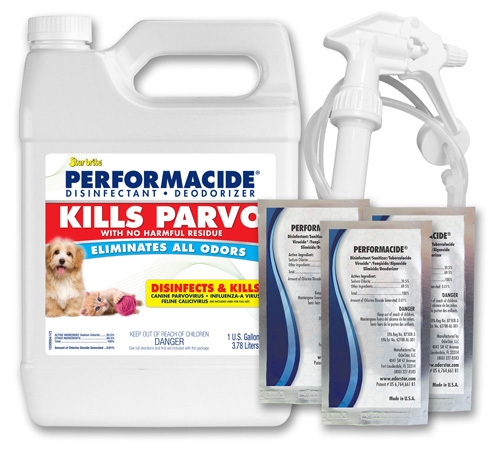 Perfomacide® is also ideal for use in homes with puppies that are too young for vaccination or other dogs that may be susceptible to viruses. 1 pk refill for 32 oz. 6 pk refill for 32 oz. Directions for mixing: Add pouch to pre-measured amounts of water, and allow 60 minutes for full activation of ClO2 solution. For 100 PPM solution add: Unused product can be stored for up to 15 days. **NOT INTENDED FOR USE ON CARPET AND UPHOLSTERY. Use on hard, non-porous surfaces only. Cautions: Keep out of reach of children. EPA warnings and directions for any personal protective equipment only applies to the dry ingredients in the sealed inner activation pouch, with which personnel should never come into contact.